With 8,204 mm runways, the HDS-27X is the first extended-length model in BendPak's super-duty four-post series. As a super-long lift that holds up to 12,247-kg., this incredibly versatile lift accommodates massive Class 7 semi-trucks. There isn't much this lift can't handle. Commercial lifting solutions for semi-trucks and other municipal vehicles fall into a category all their own. That's because vehicles reaching the 12,247-kg. lift capacity begin to develop monstrous proportions. The super-long HDS27X handles stretch limos, semi-trucks, city buses and other super-duty vehicles. In fact, 12,247-kg. should handle a typical garbage truck without a hitch. The best part of being in the heavy-duty maintenance industry is that your competition is relatively low. Most auto shops veer away from servicing commercial fleets. They require specialized equipment (which BendPak makes easy to obtain) and more shop space, which you probably already have covered! If you want to dominate your industry with a reliable commercial fleet of lifts, you'll absolutely need the incredible HDS27X. Our 8,204 mm runways are absolutely massive. Runways are made wide and rise 1,524 mm in the air, so operators can work on virtually anything in a comfortable standing position. To protect your investment, each sheave is a massive ​305 mm in diameter. The equally impressive 102 mm sheave axles greatly extend the lifespan of your car lift by reducing the overall wear on the critical lifting components (cables, sheaves, axles, etc.). A super-duty lift requires extreme supports. Substantial 305 mm x 305 mm base plates hold up the massive columns on this lift for maximum structural integrity. Multiple lock positions engage as the lift rises and instantly release upon descent. Operators need not maneuver around the lift, as is the case with other brands' manual release systems. The runway movement is kept level at all times by a built-in flow divider, so operations in fast-paced shops can go on unimpeded by worry about the lifting equipment. With two safety lock systems built into the lift, it's virtually impossible for a well-maintained and properly used BendPak to fail. In the extremely rare and unlikely event that excess cable slack develops, the runways will be caught by the secondary system, the vehicle will remain level, and you will be able to safely fix the problem. Bridge jacks raise the wheels above the runways. Be sure to explore heavy-duty models, such as the RJ15000, a 6,804-kg. jack that's ideal for super-duty vehicles. Two jacks will raise all four vehicles off the runways for full access to the wheels. For many vehicles of this size, two-post lifts are not ideal for efficient and/or safe lifting. 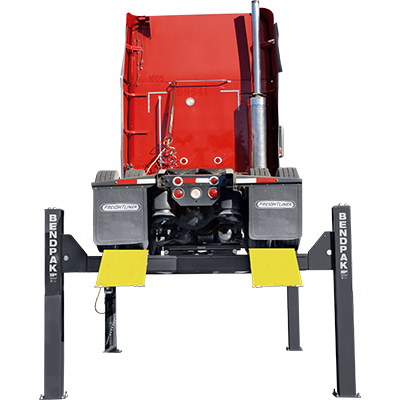 Four-post lifts and rolling bridge jacks are often the best way to perform wheel service. The jacks also prevent the need for additional space-consuming machinery.